When you hear “end of support” on one of your core products, that often is met with fear for IT professionals. With Azure & Carbonite transforming your on-premise SQL 2008 server to the cloud, it can provide security, flexibility, and saving for your company. Join our exclusive webcast for an overview on what this end of life means for your data, how Microsoft Azure could put your business on the fast track for success and how Carbonite’s solutions can simply migrate your data into your new environment. Sign up today for this 30-minute webcast by Microsoft and Carbonite and learn why an end of life doesn’t mean the end of your business. Start your planning now because July 9, 2019 will be here before you know it. Every business is trying to stay ahead of the technology curve by putting their data in the cloud. Identifying the best cloud platform to trust with your data, and finding a single provider capable of creating cloud solutions designed for you and your business needs, are the keys to a successful transition. Join our exclusive webcast for a technology overview that shows why Microsoft Azure is the most trusted cloud for business data. 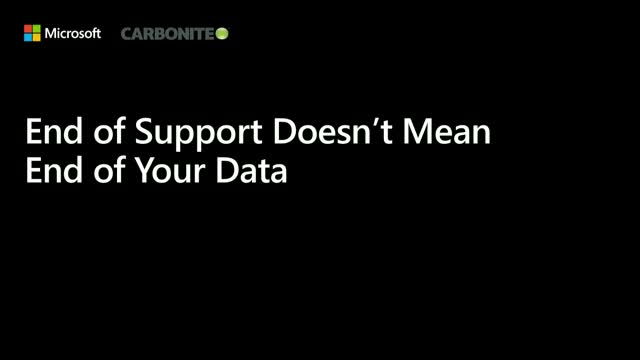 You’ll also learn about Carbonite’s solutions for quick Azure on-boarding and protection of your cloud data. Sign up today for this joint 30-minute webcast by Microsoft and Carbonite and learn how your business can accelerate its movement to the Azure cloud. Edwin Yuen, Sr. Analyst, Enterprise Strategy Group, Inc.
It’s increasingly difficult to make apples-to-apples comparisons among VM backup products, because functionality, deployment options, and pricing models vary widely. So, SMBs must look beyond list price and understand the total cost of ownership when making a purchase. James Nelson, President, Business Continuity Services, Inc.
Data protection and disaster recovery are changing constantly. Risks and exposures are expanding. Are you keeping up? Are you prepared for the worst-case scenario? Can your data handle the disruptions? No business is immune from disaster. Businesses should assume the worst will happen. That’s why everyone should prepare to reduce the impact that these disasters will have on their technology. Planning ahead may be the difference in your business surviving technology interruptions and data loss. Threats to your backup infrastructure continue to rise – the data that resides there and the applications it has access to are a prime target for a cyber-attack. At Carbonite, we’ve helped over 10,000 customers prevent or recover from cyber attacks in their many forms but even we are not immune to attacks. Join our webinar and hear from our own head of cyber security, Jeannine Gaudreau, about tactics we use at Carbonite to prevent and recover from a cyber security event. We will also have a question and answer session where we discuss a few different case studies and how we’ve employed similar tactics to assist our customers. - Ensuring that your disaster recovery plan can live up to its promise. - Find it easier to plan for any kind of data disaster—and easier to get buy-in on the best solution for your business. As an IT professional at a small or midsized business, you know what’s at stake if a disaster—natural or human-made—strikes your organization. And you understand the value of a Disaster Recover as a Service (DRaaS) plan. But how do you convince top executives to invest in a DRaaS plan, especially if they believe DRaaS plans are too expensive? - How to talk to business decision makers to get the disaster recovery service your organization needs. To develop a strong BCDR strategy, you start with the facts. A business impact analysis is, at its heart, a fact-finding mission. In the event of downtime, what would happen to your company? Do the BIA right and you’ll come to a deeper, more realistic understanding of your company’s current state of operations—and pave the way for creating a recovery strategy that actually works. Do it wrong and you’ll overwhelm your participants, alienate your IT department, confuse your senior management team, and - worst of all - devise recovery strategies, solutions and plans that won’t recover your business. Today’s cybersecurity attacks are spreading faster, evolving quicker and targeting every organization regardless of size. Challenged with limited security resources, the most exposed part of many organizations is usually the least protected; endpoints. As workforces become increasingly mobile, protecting data on laptops, tablets and endpoints of all kinds has become a unique and evolving challenge for IT departments. In many cases, traditional backup solutions are no longer sufficient to protect the data that companies depend on for continued success. This presentation will take the form of a fluid discussion around the important data protection issues facing today’s IT environments—paying special attention to the benefits of true endpoint protection. We’ll also be covering virus protection and related issues. Many companies take advantage of virtual servers for the dual benefits of cost effectiveness and scalability. But when the time comes to move data to a virtual server—or between virtual environments—a lack of preparation can mean extra costs, or worse, lost data. This webinar will cover best practices around managing data in a virtual environment, and offer key watchouts for those who are newer to virtual servers. We’ll also offer pro tips and expert advice for data migration involving virtual environments, with ways to keep the operation as simple as possible and avoid common pitfalls. And we’ll even show you how you can automate most of the process. The cost savings offered by cloud solutions and IaaS can bring budget serenity—the benefits of eliminating backup servers, storage, software licenses and portable media can really add up. But cloud computing presents its own challenges. You need to know exactly how far a provider is willing—and able—to go to meet SLAs. Also, what guarantees are made for uptime and data retention? What sort of restitution is offered for service disruptions? In the cloud, these answers are rarely as simple as they are with in-house solutions and processes. Join us for a discussion about building a complete data protection strategy—leveraging both on-premise infrastructure and cloud services—for the right balance of price and performance. To achieve this, there is no one size fits all set of technologies to meet stricter RTO’s and RPO’s. Business priorities and objectives must be matched to fail-over and replication options to achieve truly modern, cost-effective and resilient data protection solutions. Join us for a complimentary webinar where we discuss 6 action steps to shift your focus from traditional IT disaster recovery to total business resiliency. When it comes to cyber-risk, the most exposed part of any organization is also the least protected; endpoints. Much of the data on laptops and other devices is unique and not stored on storage owned by the organization, but endpoints are often the first casualties of a cyber-attack. Given the new threat organizations need to provide complete protection, which not only includes protection from device failure but also ransomware attacks, device theft and litigation response. The challenge for IT is providing this protection without disrupting the user. If the protection solution gets in the way of the user, they will disable it, putting not only their data at risk but leaving the organization open to data loss and cyber-breach. Disaster Recovery as a Service (DRaaS) can be a positive and cost-effective solution as part of your Enterprise Resiliency Program. But for all its benefits, it shouldn’t be viewed as a magic wand. DRaaS advantages and limitations should be carefully considered and explored by both the Business and IT to ensure that it aligns with overall strategy and can achieve maximum results. Philip Bigge is the Vice President at Ripcord Solutions. Phillip has over 20 years of experience working with Fortune 500 companies building sustainable Business Continuity, Disaster Recovery, and Crisis Management programs. Philip has successfully led these organizations through 40 major disasters. Philip believes every Business Continuity program must be designed to enable the organization to recover, meet customer and regulatory demands, and be maintained at a low run-rate cost. Tom Powers, Director of Program Management at Carbonite, is responsible for product delivery and works closely with engineering and go to market teams on new releases and offerings. Prior to joining Carbonite, Tom was Director of Operations for Client Services at Avaya where he helped ensure successful onboarding and serviceability for customers. He also spent time at IBM working on the M&A team where he helped integrate several acquisitions. Tom has a passion for delivering innovative products that solve challenging customer issues. When the people and processes within your business work as one to achieve BCDR resiliency, you can rest easy in the knowledge that you’re prepared for any interruption that comes your way. Join us, and discover how thorough planning leads to peace of mind for everyone involved. Jason Buffington is the principal analyst at ESG focusing on all forms of data protection, preservation and availability. He has actively deployed or consulted on data protection and storage solutions for 28 years, working at channel partners, multiple data protection software vendors and Microsoft. Jason has been a featured speaker at many server-infrastructure, business continuity and storage events around the world, and his articles have appeared in numerous IT industry journals. This presentation will cover the basics of ground-to-cloud and cloud-to-cloud data migrations. We’ll show you the best ways to avoid the most common pitfalls associated with each type of move. You’ll learn how simple it can be to sidestep the dreaded problem of vendor lock-in, and you’ll see how to use automation to your greatest possible advantage. Cyber threats and natural disasters are increasing in frequency and severity. RTO’s and RPO’s are becoming more strict and difficult to achieve as the volume of business critical data grows. Having traditional backup alone is no longer an adequate data protection strategy. IT professionals must put a range of recoverability options in place that aligns costs and technology with application and data criticality. Join us for a complimentary webinar where we will discuss why and how a hybrid approach to data protection can help you reach IT Zen. View our webinar and ensure your BCDR strategy aligns with the needs of your business.